And how appreciative we are when the leaves actually turn to gold (and yellow, and orange, and red, and rust). Soon after, they flutter to earth in a blaze of glory, to be succeeded by the next generation at the coming of spring. Blended shades of gold, orange, rust and brown enrich both indoor and outdoor settings with a touch of autumn. Because each cover is hand painted one at a time, no two are exactly alike. 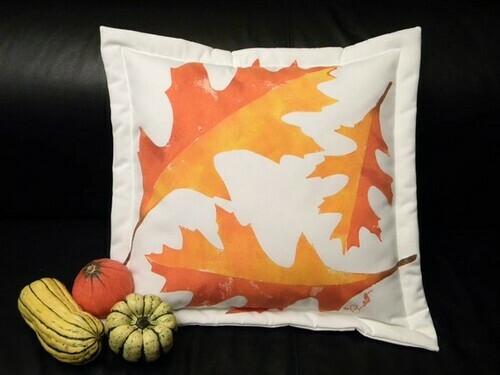 This 19" square indoor-outdoor pillow was hand painted in the Pacific Northwest, inspired by the beautiful form of the leaves of the black oak. It is fluffed with a removable insert of polyester fiberfill, and both the cover and insert are washable. The nontoxic textile paint is heat-set for permanence, sure to add a bright spot of color to patio, media room, garden bench, entryway, guest room or dining banquette. Designed, painted, sewn, stuffed, signed and copyrighted by the artist on Camano Island, Washington. Please enjoy!